Denton Ryan quarterback Spencer Sanders piled up 485 total yards and had a hand in seven scores in just over one half of football during his team's 69-49 victory over Lubbock Coronado in the Texas UIL Class 5A, Division I quarterfinals in Abilene on Saturday. Two days later, Sanders was named Gatorade Texas Player of the Year. The Oklahoma State pledge has thrown for 3,589 yards and 51 touchdowns while rushing for 1,220 yards and 14 scores on the ground. 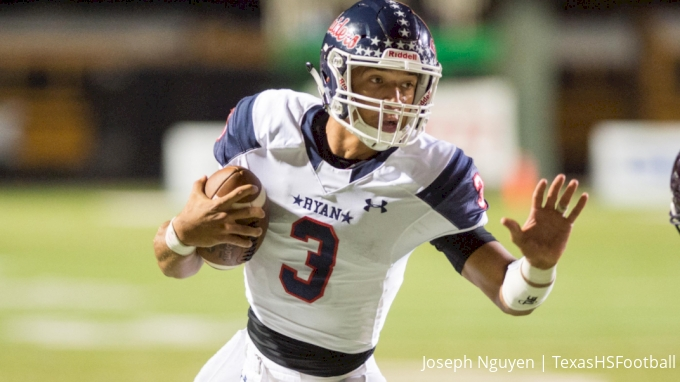 Undefeated Ryan (14-0) is just a win away from playing for a state title.